It is very difficult to encapsulate the incredible achievements of our beloved King in this short article. The writer, rather, has highlighted just some of the events, honors and accolades which have been dedicated to His Majesty, particularly in this auspicious year of his 83rd birthday. Born on Monday, the fifth of December, 1927 at the Mount Auburn Hospital, Cambridge, Massachusetts, HM King Bhumibol Adulyadej the Great reaches his eighty-third birthday just a few years after celebrating sixty years on the Thai Throne. 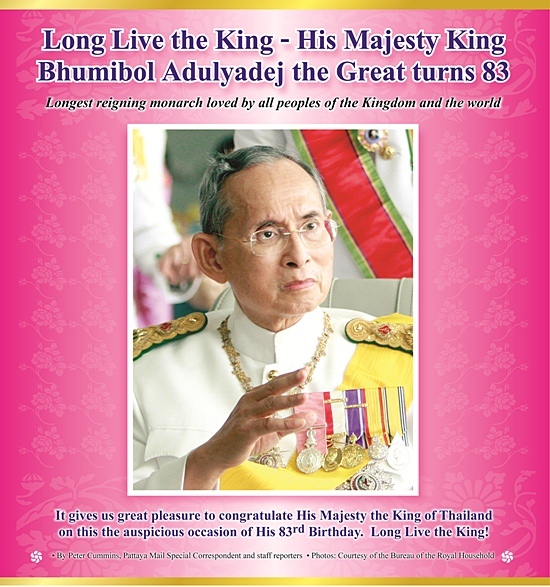 As the Thai people - and, in fact, people all around the world - honor this year’s anniversary of the birth of the world’s longest-reigning Monarch, the Pattaya Mail, Chiang Mai Mail, Pattaya Mail Television and Pattaya Blatt present this supplement as a “Happy Birthday” tribute to our beloved King. In his Coronation Oath, promulgated on the fifth of May 1950, the newly-crowned King Rama the Ninth vowed that, “We will reign with righteousness for the benefit and happiness of the Siamese people,” and in all the years which have passed since that auspicious day, the concept of “righteousness” has dominated his reign. In fact, HM the King has, throughout his more than six decades of rule, constantly revered the age-old Buddhist concept of ‘Kingship’ as defined in the “Sutta Pitaka” of the “Tripitaka” in which a King is defined as “Mahasammata” - a King of Righteousness. Our King has steadfastly reigned by these principles, embodying good Kingship in his own life and often speaking out against the affliction of the evils so clearly spelled out in the Buddhist philosophy - evils and afflictions which seem to have become progressively worse in the past tumultuous years. During this past year, HM the King reached two more historical milestones in his remarkable life when, on April 28, His Majesty King Bhumibol Adulyadej and Her Majesty Queen Sirikit celebrated their 60th wedding anniversary; and a week later, on Wednesday, May 5, 2010, when the Kingdom marked the 60th anniversary of His Coronation. 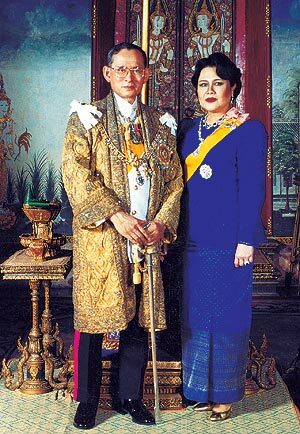 His Majesty King Bhumibol Adulyadej the Great and Her Majesty Queen Sirikit celebrated their 60th wedding anniversary on Wednesday, April 28, 2010. His Majesty King Bhumibol Adulyadej and Mom Rajawongse Sirikit Kitayakara were married by Her Majesty Queen Sawang Vadhana, the paternal grandmother of His Majesty, at the Sra Pathum Palace in Bangkok on April 28, 1950. 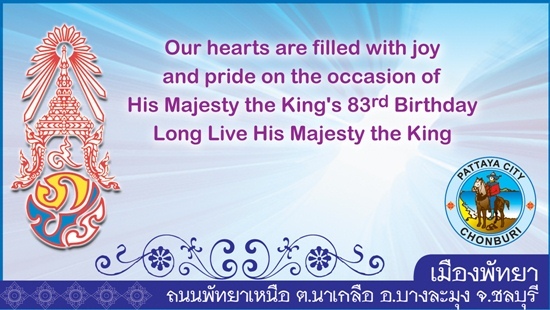 One week later, on Wednesday, May 5, 2010, the Kingdom marked the 60th anniversary of the Coronation of His Majesty King Bhumibol Adulyadej the Great. His Majesty the King was pronounced successor to the throne in June 1946. 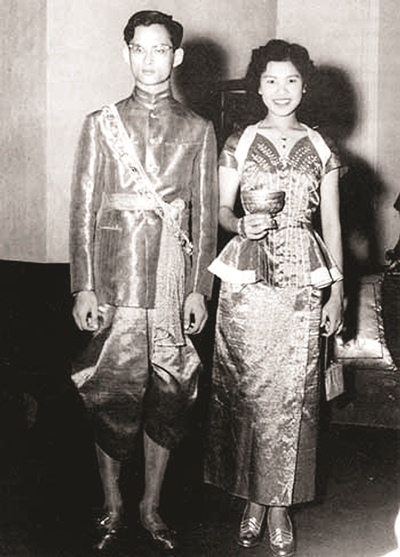 After four years of studying in Europe, he returned to Thailand and was crowned on May 5, 1950 during an elaborate and highly intricate ceremony. In the beginning of the Ratanakosin era, the first King in the Chakri Dynasty (King Buddha Yot Fa Chulalokmaharach) took the title of Rama I and moved the capital of Siam from Thonburi to the opposite bank of the Chao Phraya River, and constructed Krung Ratanakosin (Bangkok). In the process of building the Royal Palace and Wat Prakaew (Temple of the Emerald Buddha), the first King in the House of Chakri refined the coronation ceremony, establishing important protocol that has lasted to this day. 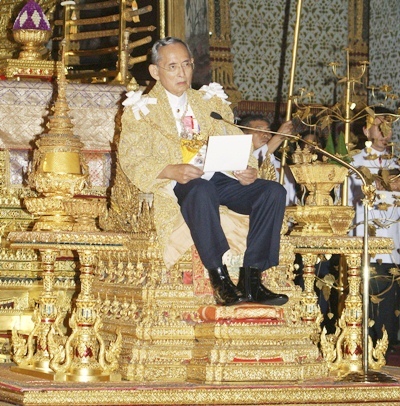 HM King Bhumibol Adulyadej reads a statement during a ceremony on his 82nd birthday celebration at the Borombhimarn Throne in Bangkok, Saturday, Dec. 5, 2009. On Wednesday, May 5, 2010, the Kingdom marked the 60th anniversary of the Coronation of His Majesty King Bhumibol Adulyadej the Great. The annual commemoration of the coronation ceremony is a three-day affair, starting with a ritual “tam boon” ceremony on May 3 to honor the King’s ancestors. Later on the first day, another ceremony is performed, whereby flags of honor are issued to distinguish various military units. The following day, Buddhist ceremonies continue with chanting rituals, prayers and Brahman priests announcing the auspicious occasion of the next day (May 5). In the evening HM the King conducts another sacred ceremony: changing the yellow cloth on the Emerald Buddha, the guardian symbol protecting the Thai people, which was transferred from Thonburi to Wat Prakaew by King Rama I. In January 2010, HM King Bhumibol Adulyadej asked his subjects to work with utmost efficiency and for the benefit of the public interest. 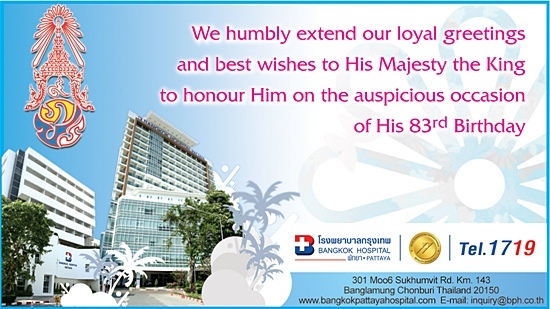 His Majesty, who has been hospitalized at Bangkok’s Siriraj Hospital since September 19, 2009, initially with a lung infection and fever, said in his New Year message that Thais who love their country should dedicate themselves to carrying out the tasks they have before them to the best of their ability. Most importantly, faithful Thais must realize that the common good is long-lasting and benefits everyone, HM the King said. The common good creates happiness for individuals and the country as a whole as wished by everyone. 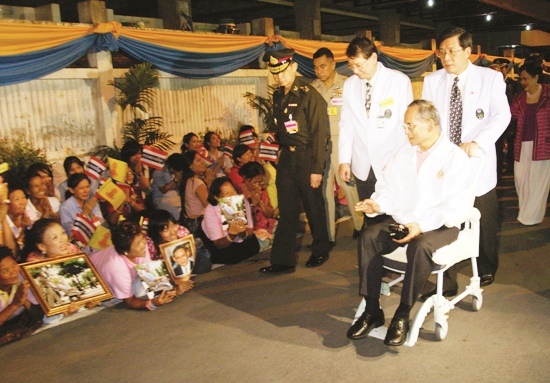 HM the King also thanked his subjects for their concern for his health. His Majesty the King continued to have many official duties over the past years, continuing right through to this year, up to his 83rd birthday. 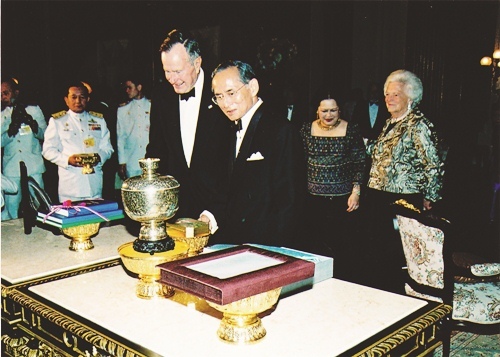 On December 11, 2006, His Majesty the King hosted a dinner reception at the Chakri Throne in the Royal Palace for visiting former US president, Gorge Bush and his wife, on the occasion of their visit to Thailand as guests of honor representing the US President to pay their respects to HM the King on the 60th anniversary of his ascension to the throne. Knowledge helps you to understand religion on a broad basis; religion helps you understand knowledge in depth. Therefore knowledge and religion have to go hand-in-hand; they are both essential to life. Whoever possesses both knowledge and religion shall achieve success in life without fail, because they can analyze everything in detail and a rational way. 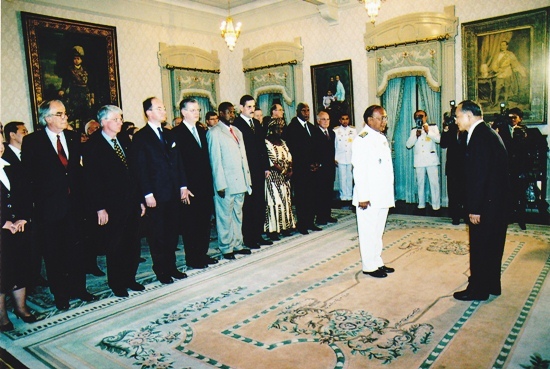 on the 2007 Constitution at Chitralada Throne, Dusit Royal Palace. When you want to study anything in depth, you have to study it from every conceivable angle, not only in part, or become fixated on a particular aspect. Secondly, what you must also do is consider the subject with an unbiased and unwavering heart. Do not let the dark influence of prejudice misguide you, whether it is prejudice in favor of, or against, the matter. Otherwise, the knowledge which is gained will not be true knowledge, but knowledge that is a mere illusion, or misleading. It cannot be applied to create benefit without incurring negative results. When you have clearly analyzed the issue with a heart that is unbiased, then only will true understanding arise, leading to a just decision and action. You must set your mind to be objective, not allowing any prejudice to prevail. Let your heart be led by truth and justice, based on reason and morality. 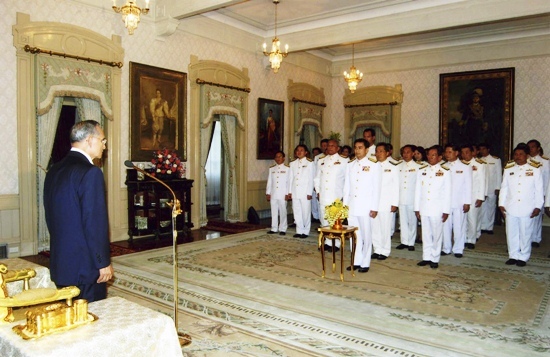 On November 23, 2007, His Majesty the King granted an audience to Akrathorn Chularat, Chief Judge of the Supreme Administrative Court, and the directing committee of the Association of International Supreme Administrative Courts, their management, and chief judges, at Chitralada Throne, Dusit Royal Palace, on HM the King’s 80th birthday December 5, 2007. Over the years, the King has established five Royal Development Study Centers - or, as they are better known - “Living Museums” - situated in the roughest terrain in their respective regions. These Centers are the locale for experiments in re-forestation, irrigation, land development and farm technology which are conducted to find practical applications within the constraints of local conditions, geography and topography. His Majesty’s aim is to restore the natural balance, to enable people to become self-supporting. The first Center organized was that of Khao Hin Son, in the rocky area of Chachoengsao’s Phanom Sarakam District. Here, the Center studies how to turn the barren soil, caused by de-forestation, back into fertile land again. Other centers are located at strategic places around the Kingdom. The Pikul Thong Center at Narathiwat studies the swampy, acidic land of the southern-most region. The Phu Phan Center in Sakon Nakhon studies soil salinization and irrigation in the country’s biggest region, the Northeast which suffers from endemic drought. The Krung Kraben Bay Center in Chantaburi examines the rehabilitation of mangrove forests and coastal areas following massive destruction. The Huay Sai Center in Petchaburi studies the rehabilitation of degraded forests and shows villagers, in their turn, how to protect the forests. His Majesty’s insightful approach to local prevailing conditions has enabled him to improvise new theories for agricultural development, to provide guidelines for educating farmers on self-sufficiency, and to solve problems of goiter by feeding iodine into salt roads at strategic points. 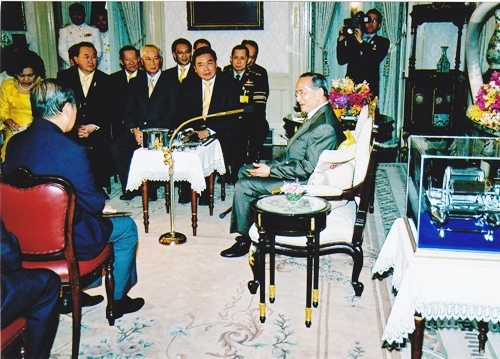 In August 2007, His Majesty the King granted an audience to Apisak Tantiworawong, chairman of the joint three private sectors committee and chairman of Thai Military Bank, along with accompanying members, to present the Chai Pattana water turbine to HM the King to celebrate his 60th year on throne. The award, introduced for the first time in 2007 as a special commemoration of the World Food Prize’s 21st anniversary, is a special honor for individuals who have provided exceptional humanitarian service in reducing hunger and poverty. The medallion is named in honor of the World Food Prize founder and Nobel Peace Prize Laureate Dr Norman Borlaug. HM the King was also lauded by Kofi Anan, Secretary-General of the United Nations, as the “Development King”, acknowledging his dedication to promote child health, combat iodine deficiency and increase access to education. And four years ago, His Majesty the King received the UNDP Human Development Lifetime Achievement Award in recognition of the global relevance of his call for a sufficiency approach to development, presented by United Nations Development Program on 26 May 2006. A different type of honor was forthcoming when several hundred thousand people took part in a walkathon on the new cable-stayed bridge, an event organized by the Transport Ministry to mark His Majesty the King’s 60 years on the throne. The Republic of Korea’s Korea Invention Promotion Association, or KIPA, last year presented a Special Prize in honor of His Majesty, who is recognized as the “Father of Thai Invention.” This organization promotes intellectual property and expands patent management support. The Budapest-based International Federation of Inventors’ Association (IFIA) presented the IFIA Cup 2007 for His Majesty’s Chai Pattana wheel used to treat water. The IFIA also presented its Genius Medal prize to honor His Majesty’s Self-Sufficiency Philosophy, and his New Theory, which revives farming techniques based on Thai wisdom focusing on minimal use of resources but aiming for higher agricultural productivity. IFIA has decided to designate February 2 International Inventor’s Day in honor of His Majesty the King, whose patent for the Chai Pattana Aerator was granted on 2 February 1993 by the Department of Intellectual Property, Ministry of Commerce of Thailand. Two years later, the Cabinet approved the proclamation of February 2 each year as National Inventor’s Day, when activities are organized to celebrate this event. 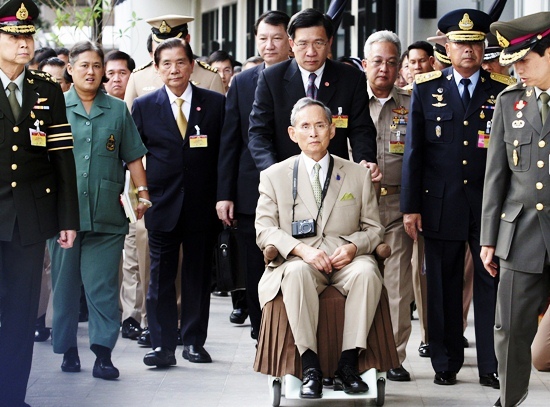 Thailand hosted the first International Inventor’s Day Convention from February 2 to 5, 2008, in commemoration of His Majesty the King’s 80th Birthday Anniversary, 5 December 2007. His Majesty is the first member of the Thai Royal Family to be granted a patent for an invention. 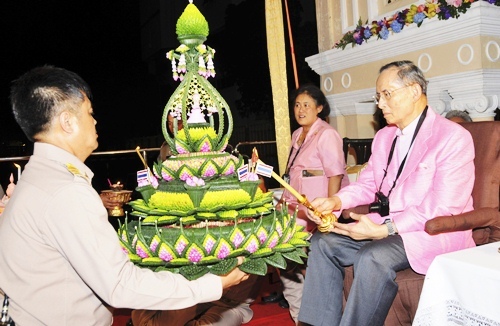 HM King Bhumibol Adulyadej, right, accompanied by HRH Princess Sirindhorn, left, lights candles during the traditional Loy Krathong festival at Siriraj Hospital in Bangkok, Sunday, Nov. 21, 2010. It has been recorded that until recently, HM the King spent more than 200 days per year, for more than three decades, in rural areas where he has initiated some 2,000 projects aimed solely at improving the well-being of his people. All of us at the Pattaya Mail, Pattaya Blatt, Pattaya Mail on TV and Chiang Mai Mail extend our humblest wishes for a most happy 83rd birthday. 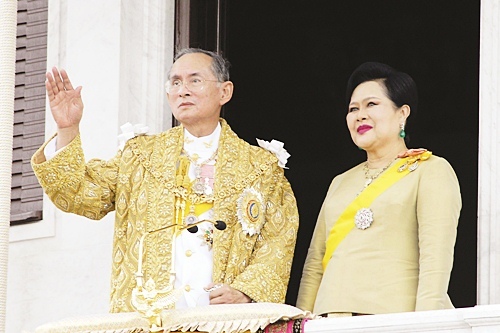 Seine Majestät König Bhumibol wurde am Montag, den 5. Dezember 1927, im Mount Auburn Hospital in Cambridge, Massachusetts, geboren. Nachdem Seine Majestät im Juni 1946 zum König ausgerufen wurde, nahm er anschließend sein Studium in der Schweiz wieder auf. Endlich, vier Jahre danach kehrte er nach Thailand zurück, um am 5. Mai 1950 in einer wundervollen Zeremonie gekrönt zu werden. Der neu gekrönte Monarch Rama IX. gelobte in seinem Eid Folgendes: „Wir werden mit Rechtschaffenheit zum Wohle und Glück des siamesischen Volkes regieren.“ Und wahrhaftig, seit damals, mittlerweile seit 60 Jahren, war seine Regentschaft von Gerechtigkeit geprägt und mit Rechtschaffenheit durchdrungen. Am 28. April 1950, eine Woche vor seiner Krönung, nahm Seine Majestät König Bhumibol Mom Rajawongse, die schöne Sirikit Kitayakara, zur Frau und kehrte mit ihr wieder in die Schweiz zurück, um seine Studien zu beenden, bevor er sein hohes Amt endgültig übernahm. Seit Beginn seiner Regentschaft, meist von der Königin und seiner zweiten Tochter, Prinzessin Maha Chakri Sirindhorn, begleitet, fuhr er in die entferntesten Gegenden des Königreichs, um sich selbst über die Probleme der Menschen dieser ländlichen Gebiete zu informieren. Der König studierte, untersuchte, fotografierte, inspirierte und versorgte sich unermüdlich mit dem nötigen Wissen, gab dann Ratschläge und leitete Folgemaßnahmen und Wohltätigkeitsprojekte in die Wege. Der thailändische Monarch, bekannt für seine unbeugsame Entschlossenheit, das Leben aller seiner Untertanen zu verbessern, hat eine außerordentliche Verpflichtung auf sich genommen, die in aller Welt begeistert anerkannt wird. Bilder des Königs, wie er oft über Karten und topografische Darstellungen eines Gebietes gebeugt am Boden kniet oder sitzt, oder von Dorfbewohnern umringt wird und mit ihnen ihre Probleme diskutiert, gingen um die ganze Welt. Der König liebt Einfachheit: „Die Ergebnisse einer jeden Entwicklung“, beteuert er, „muss die Menschen direkt erreichen, um so die Überwindung unmittelbarer Probleme zu garantieren. Das bedeutet für ‚genug zum Leben, genug zum Essen‘ zu sorgen und den Menschen auf lange Sicht ‚gutes Leben, gutes Essen‘ zu verschaffen“. Der König etablierte Entwicklungsprojekte im Jahr 1969 im Norden des Landes, da er wegen des Opiumverbrauchs und -anbaus der Bergvölker sehr besorgt war. Mit diesem Projekt sollte den Opium-Pflanzungen und Brandrodungen der Bergvölker Einhalt geboten und der Lebensstandard der Bevölkerung erhöht werden. Unter der dynamischen Anleitung des engen Freunds des Königs, Prinz Bhisadej Rajani, dem Direktor der Projekte, der von seiner Basis an der Chiang Mai Universität aus arbeitet, gibt es momentan vier Forschungsstationen und 35 Königliche Projektentwicklungs-Zentren im Einzugsbereich von etwa 300 Dörfern mit insgesamt 14.000 Haushalten und etwa 90.000 Farmern. Im Laufe der Jahre hat der König insgesamt fünf königliche Versuchsanstalten gegründet: die Aufforstung, Bewässerungstechniken, Landerschließung und verschiedene landwirtschaftliche Verfahrenstechniken. Dies Projekte sollen dazu führen, praktische Anwendungsmethoden zu finden, welche zu den örtlichen Gegebenheiten wie Landschaft und Bodenbeschaffenheit passen. Die Absicht Seiner Majestät ist die Wiederherstellung des natürlichen Gleichgewichts, und damit will er die Menschen in die Lage zu versetzen, sich selbst zu versorgen. Die Wirksamkeit seiner Methoden wurde häufig international gewürdigt. 1998 erhielten die königlichen Projekte den „Magsaysay-Preis für internationale Verständigung“ und den „Thai Expo-Preis für den höchsten Qualitätsstandard von thailändischen Exportgütern“. Die musikalischen Talente Seiner Majestät sind weltbekannt. Sie reichen von Partituren und Kompositionen von Jazz bis zur klassischen Musik. Die berühmten Wiener Philharmoniker spielten bei einem Konzert in Bangkok zu Ehren des Königs einige seiner Kompositionen. 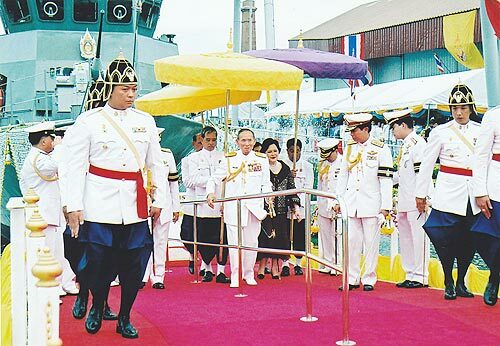 On April 30, 2007, in honor of his 80th birthday anniversary His Majesty the King graciously presided over the releasing ceremony for the Coast Guard patrol ship at the shipyard department in Bangkok Noi. Ein Glanzlicht des Konzerts war die Komposition des Königs „Kam Warn“ (Süße Worte), die von dem thailändischen Musiker „par extraordinaire“ Konteradmiral Usni Pramoj arrangiert und dirigiert wurde. An dieser Stelle muss auch bemerkt werden, dass während eines Staatsbesuches Seiner Majestät im Jahre 1946 in Österreich, in der Konzerthalle des Wiener Musikvereins, der Heimat der Wiener Philharmoniker, eine Reihe seiner Kompositionen aufgeführt wurden. Zwei Tage danach, am 5. Oktober 1946, wurde Seine Majestät Ehrenmitglied der „Akademie für Musik und darstellende Kunst“ in Wien, eine außerordentliche Ehre nicht nur für den König, sondern für ganz Thailand. Ein andere Würdigung der musikalischen Talente Seiner Majestät des Königs kam vom Nagoya Philharminischen Orchester, welches während des jährlichen Toyota Klassikkonzertes, im 16. Jahr übrigens, unter dem Taktstock des international bekannten Dirigenten Tatsuya Shimono zwei musikalische Meisterwerke in sein Programm aufnahm, nämlich „Kwam Fun Un Soong Sood“ (Ein sehr ehrenwerter Traum) und „Paendin Kong Rau“ (Unser Land). Seine Majestät der König ist auch ein bekannter Liedermacher: mehr als 40 Lieder wurden veröffentlicht. „Kwarm Fun Un Soong Sood“, ein symphonisch angelegtes Werk, schrieb er 1971. Seitdem gilt es als eine der bekanntesten und beliebtesten Kompositionen seiner Majestät. Der König wurde vom Time Magazine als „Held von Asien“ gewürdigt. „Der Beistand des Königs ist in Zeiten der Krise so meisterlich, dass die Thais sich ohne Zögern nur an einen Mann wenden: König Bhumibol“, heißt es in der damaligen Ausgabe. His Majesty the King waves to His joyful subjects during the traditional Loy Krathong festival as He is taken to the pier on the banks of the Chao Phraya River in Bangkok to watch the procession of illuminated boats and to float His krathong, Monday, Nov. 2, 2009. Ansonsten ist Seine Majestät auch als erster Empfänger der „Norman E Borlaug World Food Prize“-Medaille benannt worden für seinen ungebrochenen Einsatz zum Wohl seines Volkes. Der König wurde vom damaligen Generalsekretär der Vereinten Nationen, Kofi Anan, als der „König der Entwicklung“ gelobt, indem des Königs Hingabe an die Förderung der Gesundheit der Kinder gewürdigt wurde, den Jodmangel zu bekämpfen und den Zugang zu Bildung zu erweitern. Die königlichen Projekte waren zum Nutzen von Millionen Menschen in ganz Thailand, mit dem besonderen Augenmerk, ethnischen Gruppen und Bergvölkern in den gebirgigen Gegenden Thailands zu helfen. Nicht zuletzt kam eine Ehrung für Seine Majestät den König von der Königlich Thailändischen Armee, die ihm die Sonderanfertigug eines goldenen Stuhls übergab, mit einem Gewicht von 60 Baht in Gold und vergoldeten Teakarbeiten. 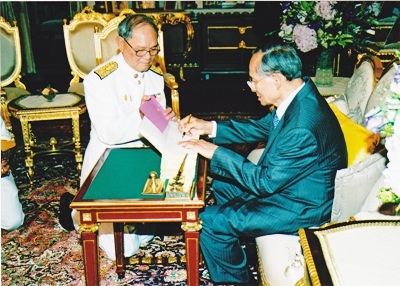 Eine der vielen internationalen Anerkennungen für den thailändischen König aus Anlass des Diamanten Jubiläums seiner Regentschaft war die Verleihung des „Bronzenen Wolfes“, des höchsten Preises der Weltpfadfinderbewegung.Im Juli 2007 übergab der schwedische König Carl XVI. Gustaf, Präsident der Weltpfadfinderbewegung, persönlich diesen Preis an Seine Majestät im Chitrlada Palast. Der König ist selbst Pfadfinder und unter seiner Fürsorge und Schirmherrschaft blühte die Pfadfinderbewegung in Thailand auf. Vor 42 Jahren stand der König selbst als Sieger auf dem Podest und nahm die Goldmedaille am 16. Dezember 1967 als Segler bei den 4. Südost-Asiatischen Peninsular Spielen (im Jahr 1975 nach Beitritt Indonesiens und der Philippinen in Südost-Asiatische Spiele umbenannt) entgegen. 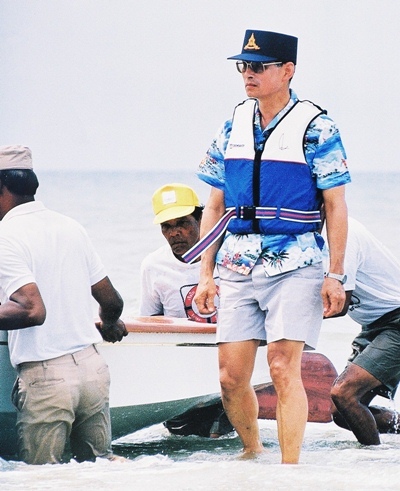 Und, wie den meisten bekannt, wird eine der besten Regattas der Region – oder gar der Welt – in Phuket, die „Phuket King’s Cup Regatta“, jeden Dezember seit 1987, zu Ehren des Königs abgehalten. Der 16. Dezember wird nun als Nationaler Sporttag im Königreich gefeiert. Dieser nautische Gewinn hat sein Pendant zu Lande, der König ist die einzige Person, die gleich vier Mal die Fackel für die Asiatischen Spiele entzündet hat, zuletzt in Bangkok im Jahr 1998 im Rajamangkala Stadion, nur einen Tag nach seinem 71. Geburtstag. Als Seine Majestät ein Brennglas benutzte, um das Feuer der 13. Asiatischen Spiele im Dezember 1998 zu entzünden, hatte dies eine symbolische Wirkung. Der Monarch, selbst ein leidenschaftlicher Unterstützer aller Sportarten im Königreich, übertrug im bildlichen Sinne das Sonnenlicht und den Segen, den dieses bringt, auf die Spiele. Seine Majestät ist wohl bekannt für sein großes Wissen über viele Sportarten, hat er doch zu verschiedenen Zeiten selbst einige ausgeübt, wie z. B. Skifahren, Motorrennen, Schlittschuhlaufen, Badminton, Tennis, Schwimmen und Golf. Als damaliger Präsident des Thailändischen Olympischen Komitees sagte Luftwaffenchef Marschall Dawee Chullasapya, als er dem König die hoch angesehene Ehre der „Insignien der Olympischen Order“ in den Rajanives-Hallen des Chitralada-Palastes im Dezember 1987 präsentierte: „Der König ist nicht nur ein Segler von Weltklasse, sondern hat sich auch an vielen anderen Sportarten beteiligt – und diese unterstützt.“ „Die olympische Auszeichnung wurde nicht nur verliehen, um das Können des Königs im Dinghi-Segeln zu würdigen“, sagte Dawee, „sondern auch für die Führungsrolle, die er inne hat in der Unterstützung aller Sportarten, in Thailand, der Region und international, immer den Bezug zur Geschichte und den feineren Punkten einer Vielzahl von Sportarten aufzeigend.“ Seine Majestät ist der einzige Monarch, der jemals diese Auszeichnung erhalten hat. Eine weitere olympische Anerkennung wurde Seiner Majestät im Jahre 2001 verliehen, als das International Olympische Komitee ihm den „Lalounis Cup“ präsentierte. Im Gegenzug überreichte der König durch die Königliche Thailändische Botschaft in Mexiko den Titel „Zweite Klasse Ritterlicher Kommandeur der Höchst Bewundernswerten Order des Direkgunabhorn“ an Dr. Sulaiman – eine der höchsten königlichen Auszeichnungen, die je an einen Sportfunktionär verliehen wurden.Ein weiterer Sportler, der die königliche Aufmerksamkeit genoss, ist Snookerspieler Noppadol Saengnil. Seine Majestät sah Noppadol spielen und erfuhr, dass dieser talentierte junge Mann von der Asiatischen Billardkonföderation ausgesucht worden war, die Region auf der 2003-2004 Challenge Tour in Großbritannien zu vertreten, aber die nötige Finanzierung fehlte. Seine Majestät bezuschusste Noppadol selbst mit seinen eigenen Mitteln, um sicherzustellen, dass dieser aufsteigende Stern am Snooker-Himmel an dem Wettkampf teilnehmen kann. Seine Majestät der König ist in all den mehr als 60 Jahren Seiner Regentschaft vielen offiziellen Pflichten nachgekommen. Auch heute noch, trotz etwas angegriffener Gesundheit und seit einem Jahr im Krankenhaus verweilend, kommt der König seinen vielen Pflichten nach. Das gesamte Königreich hofft, dass der am längsten regierende Monarch der Welt, König Bhumibol Adulyadej der Große, noch viele weitere Jahre seinen Untertanen ein leuchtendes Beispiel in einer mit Problemen belasteten Welt sein wird. Gemeinsam mit dem thailändischen Volk gratulieren auch Pattaya Blatt, Pattaya Mail, Chiang Mai Mail und Pattaya Mail on TV mit dieser Beilage, Seiner Majestät, dem am längsten regierenden Monarchen der Welt, aufs Allerherzlichste zu seinem 83. Geburtstag und überbringen ihm die besten Wünsche.